OXO and Plated chose me as one of the few bloggers for this “very vegetarian recipe challenge.” I honestly thought it’s great time for me to go on a relative vegetable cleanse for my diet since I attended and ate at many food events (just look back a few posts or my Twitter and you’ll see what I mean). To those who are not familiar with fennel, it looks sort of like a white onion bulb with a long green stem that has delicate green fronds growing out at the end. It tastes quite licorice-y or anise in its raw form and it’s very mellow and sweet when it’s roasted. 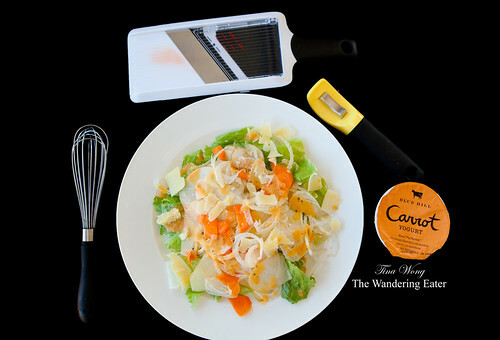 I did use a fancy new carrot yogurt from Blue Hill Yogurt to reinforce the carrot’s flavor and sweetness as well as keeping the dressing in emulsion form (so when the dressing does sit in the refrigerator, it will still stay as a homogeneous liquid). You are more than welcome to use any plain yogurt that’s strained in a cheesecloth overnight or plain Greek yogurt to have the texture but you might need more honey to counteract the tartness of the Greek yogurt. What makes this particular salad flexible to create from a first or salad course to something more substantial, you could add healthy grains like cooked quinoa or bulgur with a sprinkling of chives and remove the salad greens and croutons. You may have a crunchier texture by adding toasted chopped nuts of your liking. 1. On the cutting board, take your apples, fennel and carrots and cut it with the OXO hand-held mandoline slicer with it’s thinnest setting. 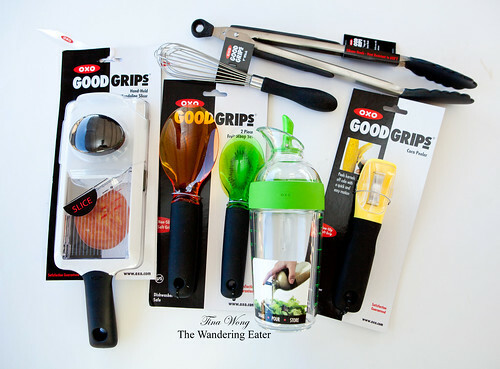 *Safety tip:* Please use the hand guard while slicing or you’ll cut a part of your finger or knuckle!. You are more than welcome to have the apples cut a touch thicker if you like its crunch but the fennel must be sliced at its thinnest setting. Place that in a medium sized bowl. 2. In a medium sized bowl, add the yogurt, lime juice, olive oil, salt and pepper, and whisk until it’s blended into an emulsion. Take this dressing and pour it (as much or as little) into your bowl of thinly sliced apples, fennel and carrots. Toss with the tongs. Set aside. 3. To assemble: There are many ways you can plate this salad; just don’t make the (stupid) mistake of adding the crunchy croutons beneath the bulk of the salad like I did or your croutons will become soggy. 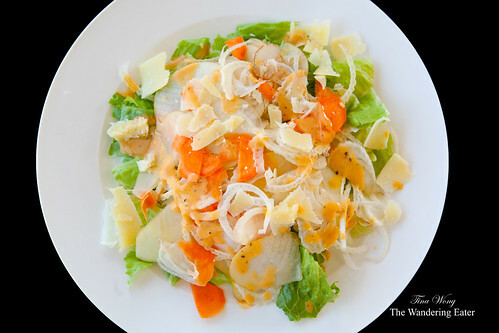 Similar to how I plated, you first create a layer with chopped lettuce, add the apple, fennel, carrot mixture on top and drizzle the dressing/emulsion on top. Sprinkle the croutons on top. 4. Take your wedge of hard cheese and use the OXO corn peeler to create thick curls of cheese. Serve immediately.